Majority of the Internet users including me uses the Google search engine to look for information on the Internet. The Google robot crawling and indexing algorithm is definitely way more advanced if compared to other search engines such as Bing or Yahoo because I tend to get better search results in Google search engine. On the Google search results page, clicking on any links will forward you to the website but it actually has something hidden going on before sending you to the website which is Google tracking what you’ve clicked. Some may argue that this is an invasion of privacy but to me this is still acceptable because they require these data to compute a better ranking algorithm and to improve their search results. If you move the mouse cursor over to the link on the Google search results, it will show the direct link to the website in your web browser’s status bar but if you copy the link and then paste it to Notepad, you will see that the link contains some random letters and numbers with the direct link somewhere in the middle of the URL. The sample URL below is taken from Google search results when searched for the keyword “raymond.cc”. If you look carefully, you will notice that the direct link is in the middle of the URL which I have bolded. The percentage followed by 1 or 2 characters such as %3A are called URL encoding and you can decode them using some online URL decoders to get the full direct link in readable characters. I’ve recently started sending DMCA copyright notices to websites that has copied articles from this blog and published on their website without our permission. It is easy to find these copycat websites by searching a short paragraph but compiling the links is very time consuming since I couldn’t just copy the URL directly from the Google search results. I need to open the links from the search results on a new tab, wait for the page to load and then copy the link to a text file. The most annoying part is some of the websites takes a very long time to load or it contains so many scripts that causes my web browser to hang. Fortunately there are third party extensions or scripts for Firefox and Chrome web browsers which can automatically convert the gibberish link to the actual website link. 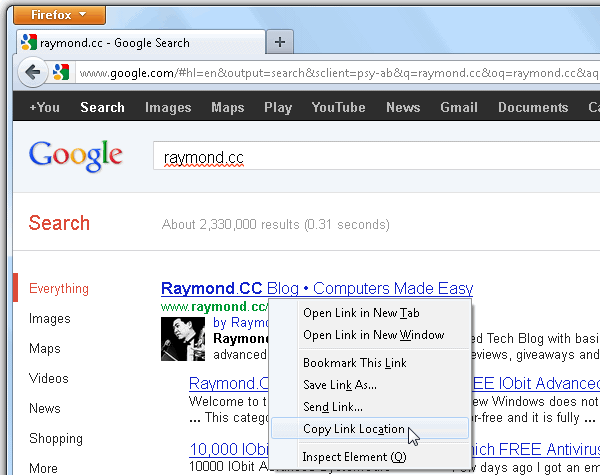 For Firefox, simply install the Google/Yandex search link fix extension. If you have GreaseMonkey installed in Firefox or are using Google Chrome, you can install the Don’t track me Google userscript. Both of this plugin and userscript works right out of the box without requiring any further configuration. I personally prefer to use Firefox to get the direct website links because I can press the “A” key after right clicking on the link to “Copy Link Location” instead of moving the mouse cursor to the copy link location and then left click to copy. Using the keyboard is always faster and more accurate when compared with using the mouse. If you are concerned about Google tracking the websites that you visit from their search engine, you can use either extensions to prevent that from happening. Is this an alternative to “Do Not Track Plus” and “Track Me Not” or can it – should it – be used to complement these two programs? @boyzee: That’s an interesting script. Thanks for sharing. I’ve compiled the AutoIT script to EXE and it works. Ive found a AutoIt Script that does pretty much what you want it to here. was facing this extenstion problem for a long time in chrome…thx ray for the extenstion tip…cheers..
Wow–very good information to know! I’m using NoScript and Ghostery, but these are tactics I had no idea about. Great information and when I try out, I’ll repost to let you know how it goes. Thanks!